A New Map of Turkey in Asia. 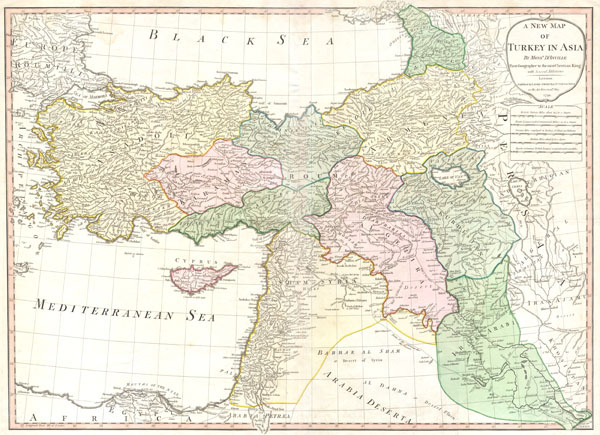 This is a stunning large format map of Turkey in Asia by the French cartographer and geographer J. B. d'Anville. Depicts the whole of Turkey as well as the modern day Holy Land (Israel / Palestine), Syria, Lebanon, Jordan, Iraq, Kurdistan, Armenia and Georgia. Inland details are prolifically notated and include such curiosities as ancient ruins, abandoned castles, caravan routes, and oases. Published by Laurie and Whittle of Fleet St. London for the 1794 English Edition of d'Anville's atlas. Text in English. Very good condition. Minor discoloration on original centerfold. Platemark. Wide clean margins. Blank on verso. OCLC 7160203. Cf P699; Shirley R. Maps in the atlases of the British Library, T.LAU-1c (1799 ed. ); The British Museum Catalogue of Printed Maps, Charts and Plans. (London: Trustees of the British Museum, 1967) Volume 14, p.511. ; NMM 375 (3rd ed. 1801); Rumsey 2310.0000.